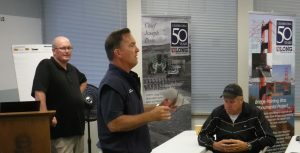 Both the LPC offices in Kent and Vancouver, Washington held their monthly Foremen meetings. Everyone was reminded to watch for changing weather conditions and several apps were suggested for use. Superintendent, Johnny Heard did a brief demonstration on effective pressure washing procedures/techniques. President, John Fisher, Production Managers, Todd Fauchald and Dan Santos handed out 5 Diamond Award checks. Awards are given to Foreman who exceed expectations while working on their project.